We love decorating for Valentine’s Day. Well, we really love any excuse to decorate or redecorate. But the bright pink and red colors add a nice pop in a time of year that can be rather gray. I mean pink is really one of my favorite colors anyway. At least I’ve got an excuse to spread it all over the house. 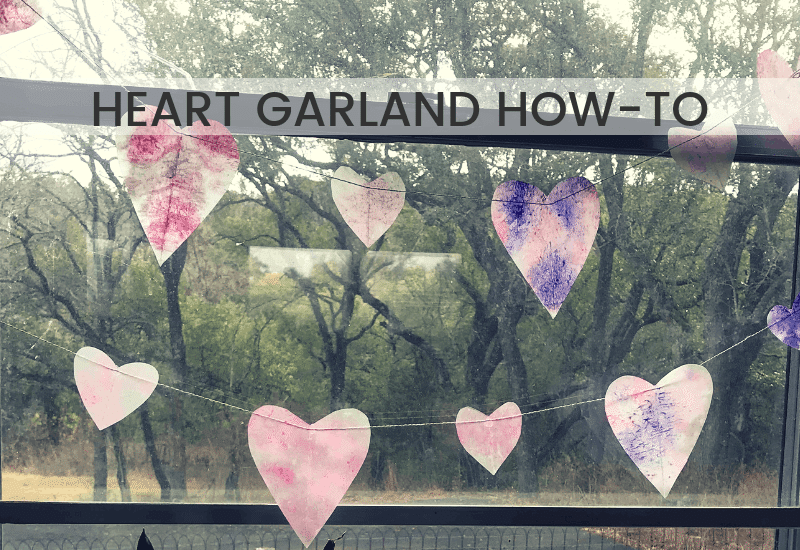 This is a valentine heart garland that you can make for yourself, or easily involve your kids in making. They’ll be delighted by the melting crayons and the pretty patterns it makes. It’s a great project to make in an afternoon and you probably already have all the supplies on hand! For this project we used craft supplies that we already had on hand and put together this easy garland. This project might remind you of your childhood. That smell of the crayons and the smell of them melting, probably a teacher’s nightmare! We started off by cutting out pieces of wax paper. We cut all of ours into heart shapes of different sizes. If you remember making paper hearts in school you know that the easiest way to cut a heart is to fold it in half to make the sides match. Since we are layering one heart over another, you don’t have to worry too much about them matching up perfectly. You can easily trim them once they are finished. 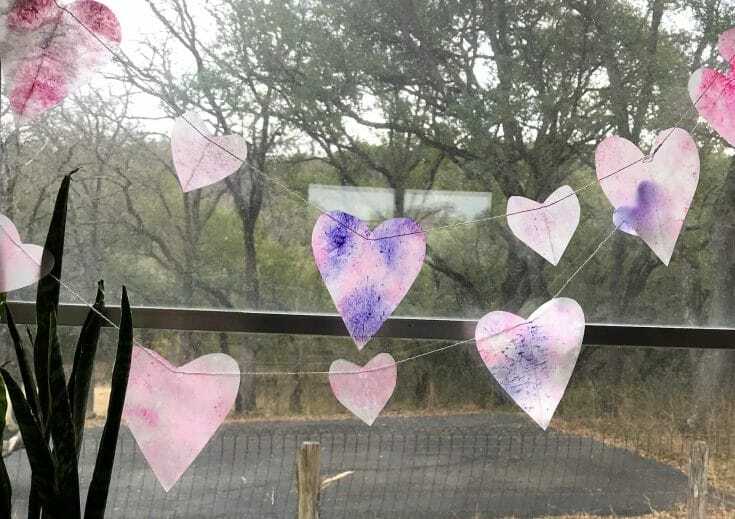 If you would like a stencil for your hearts, print out our template with the link below and place it behind your wax paper as you cut. If you’re making this project with your kids the stencil might be an easier alternative. We used up some old crayons. And I mean really old crayons. These have been in a box in the barn for years. We just peeled the wrappers off the crayons and used a pencil sharpener to shred them into bits. 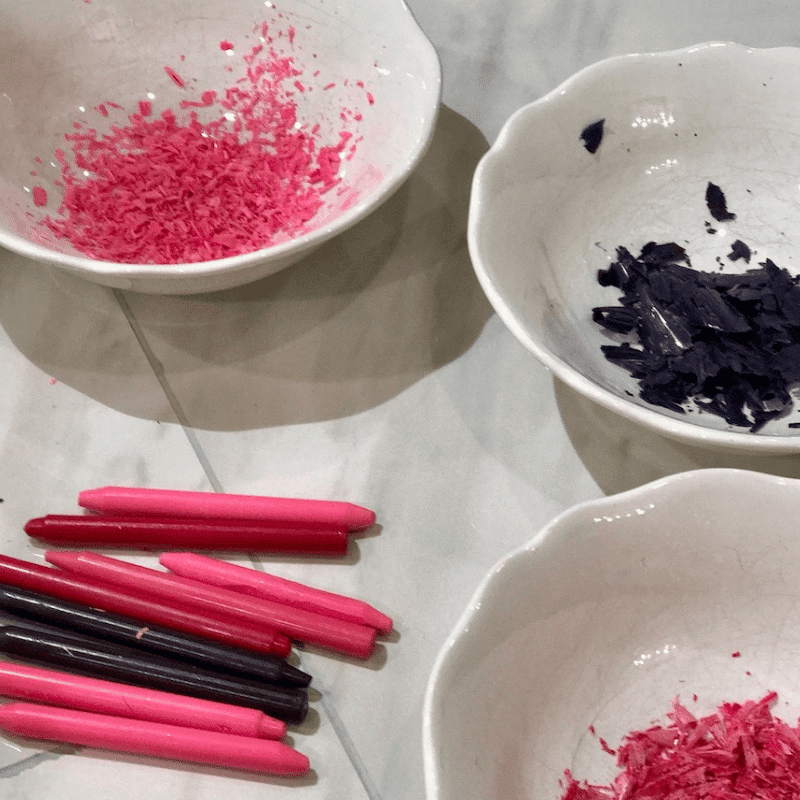 You can use a vegetable peeler or a knife to chop the crayons into small pieces. Unless you’re making a mile of garland you probably only need one crayon per color. A little bit goes a long ways when you’re melting them. 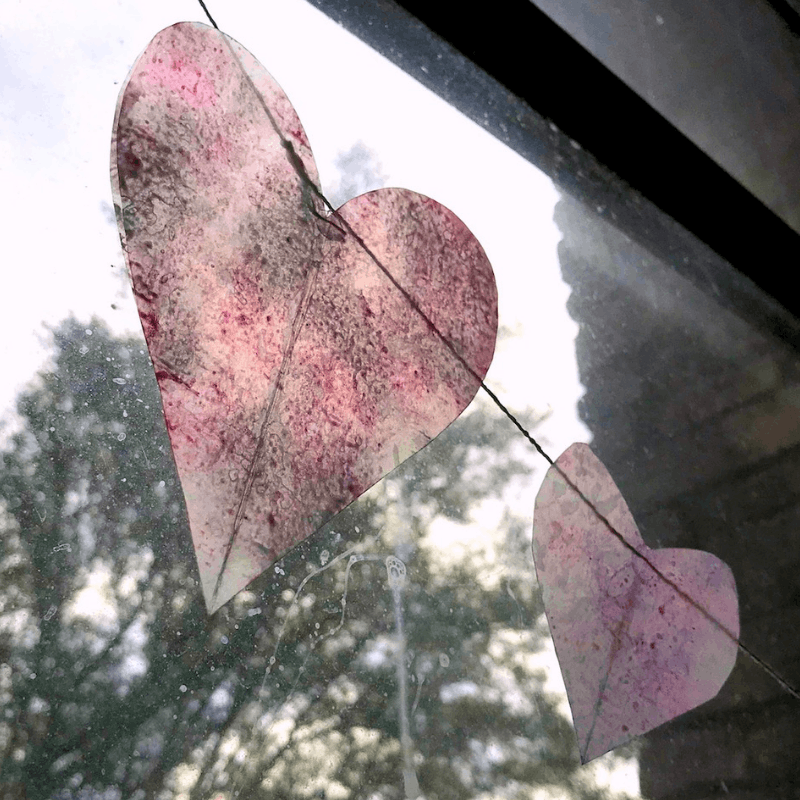 You’ll want to put a piece of parchment paper or another thick paper under your wax paper hearts first. You’ll be using heat to bind the pieces together and you don’t want to melt them to your iron, or to the surface you’re ironing on. Then you just layer some crayon shavings, another piece of wax paper and a protective sheet. Use your iron to melt the shavings. Be sure not to hold the iron in one spot too long or you may get a scorch mark. You just need to hold it long enough for the crayon to melt. Be sure your iron is set on medium, it doesn’t need to be at the highest temperature to melt the crayons. Once you’ve got your hearts made, just add a bit of glue and string and you’ve made a beautiful garland. We used several colors on each of our hearts but you could just use one color per heart for a different look. You may have to experiment with a few of your hearts at first to get the effect that you’re looking for. 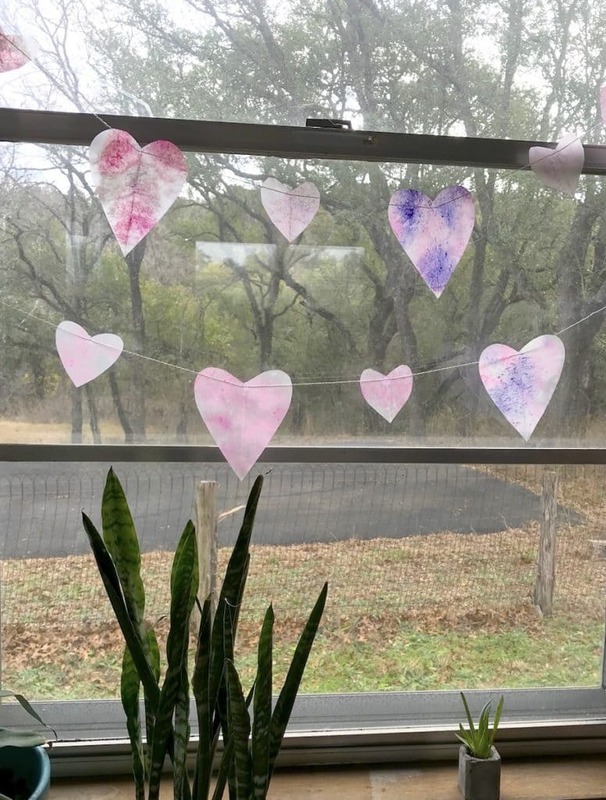 We’ve seen another option to make a full sheet of melted crayon and then cut out hearts. We tried that method and found that it didn’t work as well because you can scorch the crayons. Did you know that they’d scorch? Neither did we. 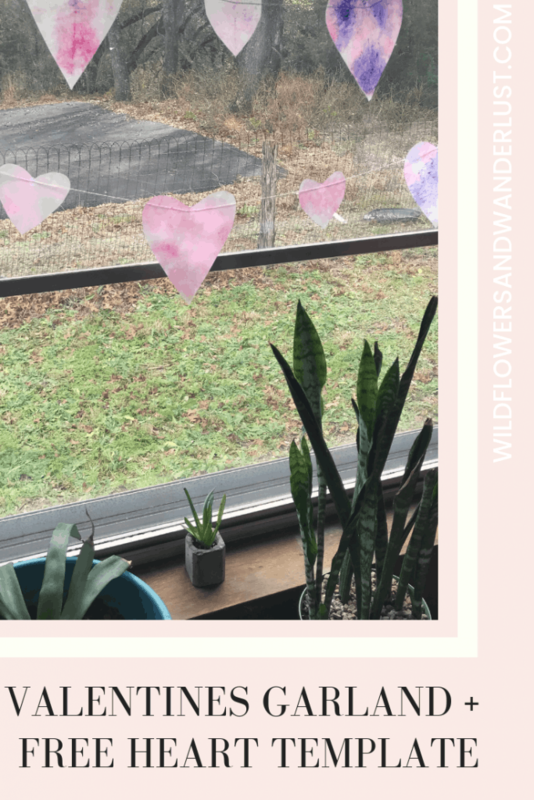 We made our valentine heart garland to hang in a window because we love having the sunshine show through it. It also looks great anywhere you’d normally put up a garland, a fireplace mantel or over a bed or mirror. There are endless ways to use a garland in your decor. Pick your Crayon colors (we chose pink, dark pink, violet, and white) and unwrap the crayon. Using the manual pencil sharpener, create bits of wax by 'sharpening' the crayon over a small bowl. Repeat for each color. 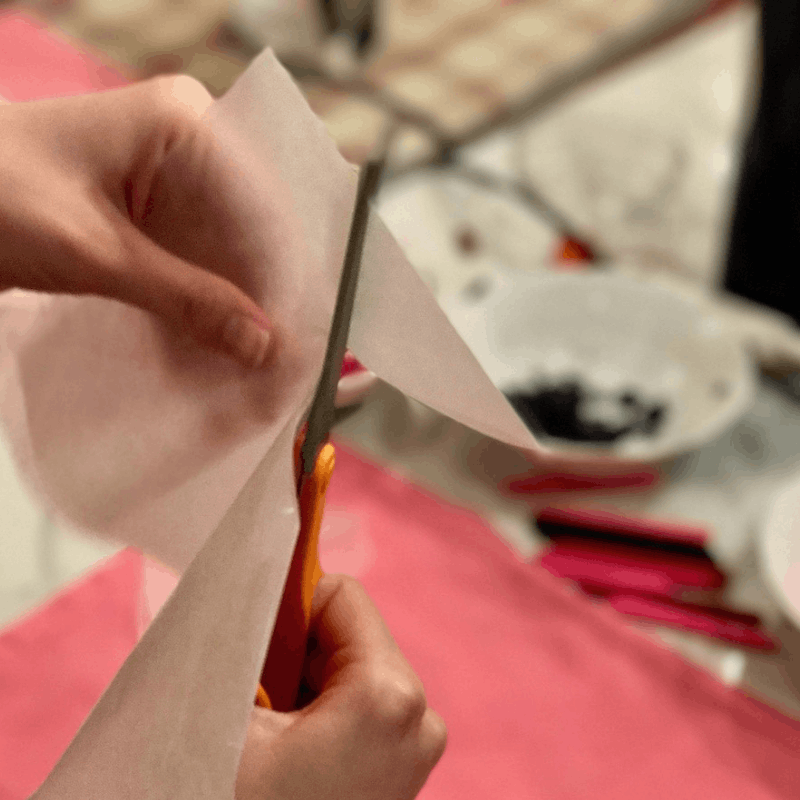 Fold your wax paper in half long-ways and then fold again long-ways. 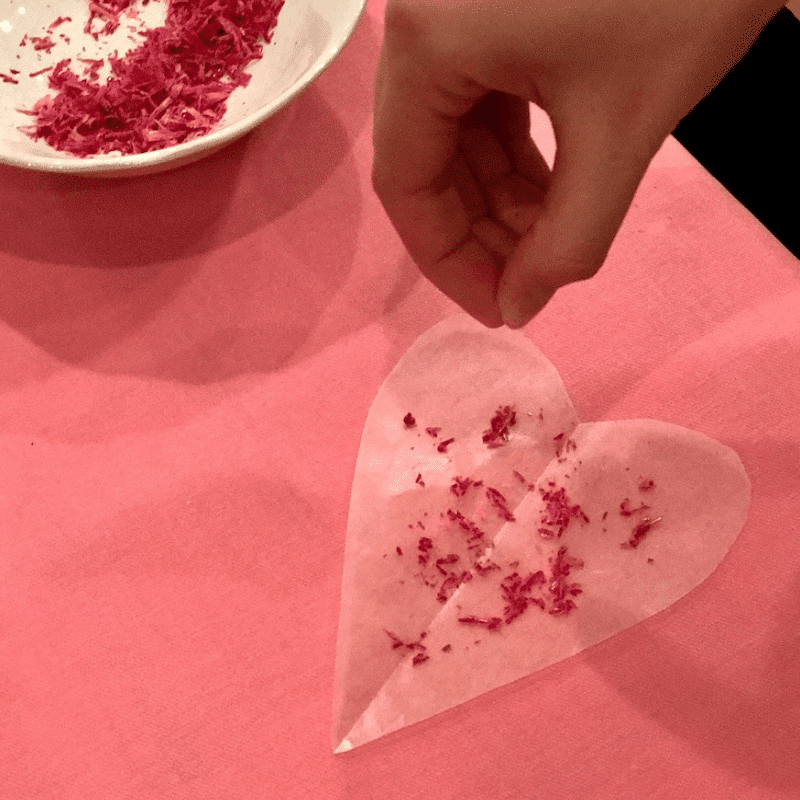 Cut heart shapes so you'll be able to unfold a pair of wax hearts with each cut. We cut 2 sizes and then copied each size for a total of 6 larger hearts and 8 smaller hearts. Turn your iron to a medium-low setting and place a piece of parchment or craft paper on your ironing surface. Place 1 heart of a pair and sprinkle with various colors of wax in a thin layer. Place the second matching heart over the first and cover with another sheet of parchment or craft paper. Iron over the parchment or wax paper for a few seconds to melt the heart. Do not keep the iron in one spot for long. Lay the heart on a paper towel or wire rack to cool. Continue until you've completed all of the hearts. Hot Glue each heart to a piece of string or twine about 2-3 inches apart. We alternated large and small hearts. You could also hole punch the hearts and thread the string through. Hang in a window to enjoy! The hearts can burn, so keep your iron swipes short and keep the temperature low. You could complete this project with many different shapes and colors so get creative!